Now that school is back in session, are your kids experiencing any anxiety about homework, tests, teachers and friends? Yes? I thought this would be the perfect time to post some helpful information to handle those stressful situations. About a year and a half ago, I had the privilege to attend a seminar hosted by an extremely insightful and intelligent speaker by the name of Renee Jain. She grew up in St. Charles with two brilliant parents who were doctors and a prodigy brother. The pressure to succeed was very high in her household. At one point, she reached a level of stress that became her breaking point. She was depressed and cracked under the weight of that pressure. Her traumatic experiences inspired her to help others by explaining how children and adolescents can handle stress in a more positive way. Here are some techniques she shared to try with your child when they are anxious. Challenge your child. Let them lean into the discomfort of the stress instead of telling them to push those feelings away. They are totally normal feelings for everyone. Expand their vocabulary. Ex. I’m feeling jealous, overwhelmed, irrational, etc. It helps you pinpoint the problem instead of using vague words such as stressed. Give permission for the emotions. Ex. It’s o.k. to feel jealous. It doesn’t make you a bad person. Touch. Hold their hand or give your child a hug. Tell them you love them. Give your child space. Breathing down their neck about a test or getting their homework done just makes the situation worse. Role play. I love this one. We get a little silly swapping roles. I’ll be my daughter and she can be the mom. It gives your child some perspective to see the situation from a new angle. The origin of worry. This goes back to the flight or fight phase of cavemen. If we didn’t worry, we wouldn’t live to see another day. Flight is our response to stress. Worry=protection. Worry is good! Keep thoughts accurate. “I have no friends!” Is this true? Use if and when scenarios. If I play with so and so, this will happen. Turn the worry into a stuffed animal. Have your child talk to her worry. Make a checklist of tools to help their worries. Yoga, running, writing in a journal, going for a walk, hanging out with friends, watching a movie, etc. I hope some of you find this list helpful. We all want what is best for our children. We can create a new set of expectations and change the way we approach stress. Just because someone isn’t happy 24/7 (and who is?!) doesn’t mean we have to fix them. Emotions occur for a reason and we were meant to experience the entire spectrum. So the next time your child is sad or worried, don’t look at it as something you need to fix as a parent. Trying some of the tools above has helped us immensely! A dear friend recently told me about a book she finished called Present Over Perfect. It changed the way she thought about everything life throws at her. I just read it and admit that, in fact, the book had a profound effect on the way that I want to approach life from here on out too. Without spoiling what this book has to offer, I want to share some parts that spoke to me. Believe me, there is no way I could possibly encapsulate everything the author, Shauna shared so this is simply a preview. As the title so wisely and concisely states, it’s imperative to be aware of your present surroundings instead of striving for the impossible perfect. Ha! Yeah, okay. Easier said than done. The author talks about her struggle with wanting to make everyone happy and how her faith sets her on the right path toward a slower, more content way of living. She’s quickly approaching 40, has a busy travel and work schedule, two sons who are under the age of 8 and a supportive husband, but there is a huge hole in this wonderful life. Her health is not the best, she constantly feels like she’s letting the most important people in her life down and, in turn, pleasing those who could care less about her. This book puts everything into perspective as she realizes what’s truly important. NOT- what other people think. The author said it best, “Of all the things I am learning to leave behind, the heaviest is the opinion of others.” Let’s face it, we can’t please everyone no matter how hard we try. I struggled with and continue to struggle with this idea the most. Trying to control what other people think or say about you is impossible. In the end, it’s all about being the best person that you can be and when you make a mistake along the way just apologize and move on. Don’t dwell on feeling guilty or worrying that someone might be mad at you. NOT- acquiring more material things. She writes, “I like living in a home when it’s less full of stuff. The simplicity feels spacious, and inspiring, like I can draw a clean breath.” This is so true. Cleaning out closets in my house is cathartic. It’s a wonderful feeling to donate clothes that don’t fit to others and standing back to see how organized they are again puts me in my happy place. NOT- avoiding situations because something isn’t quite perfect. Yet another perfectly written sentiment, “The ache for perfection keeps us isolated and exhausted-we keep people at arm’s length, if that, and we keep hustling, trying to reach some sort of ideal that never comes.” Too many times people say no to things because they’re worried about the way they look, or their house looks or whatever the circumstance. If people are truly your friends, then it shouldn’t matter if the living room still isn’t painted and there’s a stack of school papers on the kitchen counter. Your friends will still love you. Don’t miss out on life because you haven’t achieved the impossible standards you set up for yourself. The book has so many ideas, so many pearls of wisdom that I strongly encourage you to read this if you ever feel as if your life is like running a marathon and you can’t catch your breath. Life isn’t easy and this book simplifies it to make it a little smoother as well as offers ways to be kinder to your family and those close to you but, most of all, to be kinder to yourself. Thank you Melissa for this motivating read. I loved it! Growing up in the house with an avid hunter of waterfowl, I actually grew to like the taste of duck. My dad would cook it under low heat in the oven with orange juice and that was my favorite way to eat it. 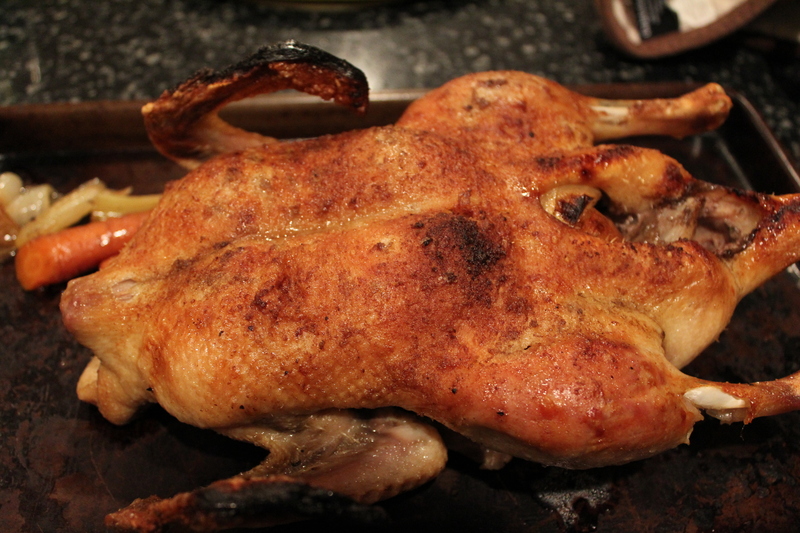 The duck I bought recently was extremely fatty. I guess I am used to lean, wild duck instead…or at least that is what I will keep telling myself. My youngest daughter ate all of it on her plate and my husband did too, along with seconds, but it still wasn’t doing it for me so that is my story. On a brighter note, we had some special people over for dinner, the perfect guests actually on a night like this one. These two people would never judge a poorly prepared dinner. Notice the paper plates and rice in a bag too? Who are these people you ask? Well, let me explain first that my oldest daughter is preparing for her First Communion this spring. As one of her assignments, we chose to plan a dinner with Jesus. 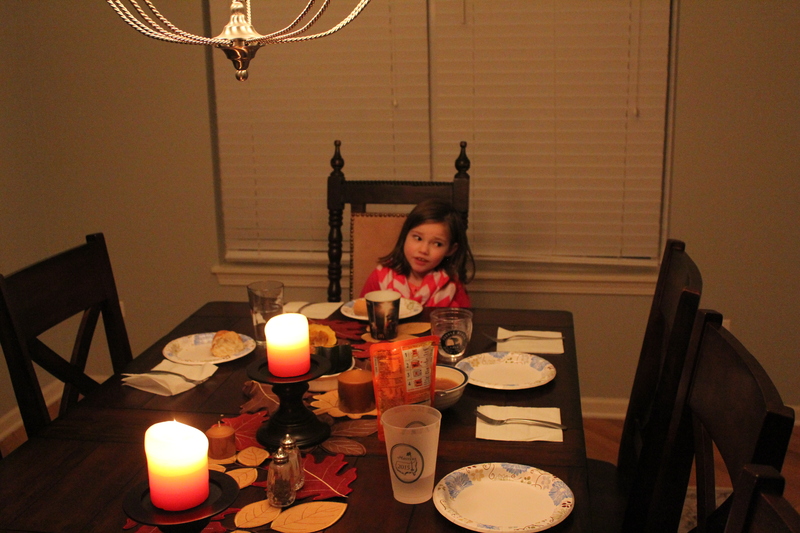 Of course we couldn’t just invite him without God according to my oldest, so she set a place at the table for Him too. Then we had to plan the menu. What would They like to eat? The girls both said bread and wine. My youngest one added meat to the menu too. So there you have it. A dinner with Jesus and God. We also needed to come up with things for us to talk about with them. My oldest was very concerned about whether or not they liked the meal, but my husband and I explained they were really there to listen more than anything else. The whole experience may sound a bit odd, but their reaction to everything was so sweet and completely authentic. We talked about how to improve at sports, showed Them some favorite board games and ended with my youngest daughter showing Them her big girl bed. Sometimes the girls would stop and ask if They were still there and I would reassure them that yes, They were. The night ended with both of them praying quietly in their rooms. This was just an idea I wanted to share for those of you looking for ways to incorporate God a little more into your everyday life. It reinforced the strength of my own faith a little more and I was surprised and delighted by my children’s responses. A picture of my sad duck.